Opening the door to a discussion of mulled wine would result in hours of debate and anecdote, (made all the more difficult if simultaneously consuming said wine). This can be proved simply by listing even a handful of its names and variations: Glühwein, Glögg/Gløgg, vin chaud, greyano vino, izvar, Glintwein, Caribou, Hippocras, Negus, and Feuerzangenbowle. It can have different bases, such as port (called a "Smoking Bishop"), ginger wine and raisins ("Smoking Beadle"), or Champagne ("Smoking Cardinal"). Then there are the mulled ciders, ales, and meads, and the close relation to punch, bringing with it further wealth of history and variation. The number of cultures with a version of this theme is mind-boggling, but the purpose behind the practice is consistently the same. Before proper storage techniques were invented, food and drink spoiled fairly quickly. One had to be creative to keep food fresh longer or at least to make stale and spoiling food more tolerable (practices that also masked poor-quality products). In Roman times, spices and sugars or honey were added to wines to delay spoilage or mask flavours, typically a practice done in the early winter once the wines harvested in early fall began to stale. This practice dates back to Greece as well, where a wine, spice, and honey mixture called "Hippocras" or "Hypocrace" (supposedly created by Hippocrates as a health tonic) was used and later became popular England for the next thousand years. Other cultures figured out similar strategies for wines and juices and as years passed practical process became tradition. 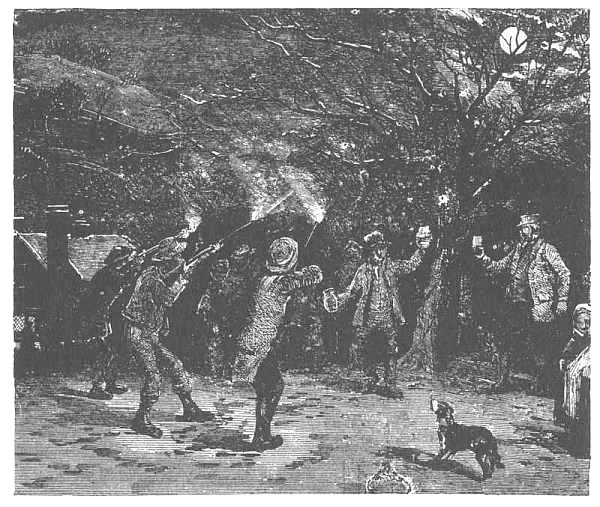 In Southern England where apples and cider (fermented fruit juice) were an important part of agriculture, a yearly autumn ritual was created sometime before the 11th century called "Wassailing." This was a ceremony celebrated in early January involving drink and song that blessed the health of the trees, scared away evil spirits, and ensured a good harvest for the following autumn. 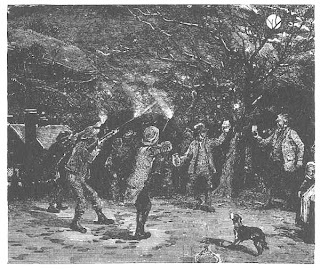 (Wassailing was also a traditional exchange between lords and peasants in the middle ages that encouraged charity, which is the origin of what we consider Christmas Caroling, but has no direct relation to drinking). The drink for this ceremony was aptly named the "Wassail," a heated ale (and later cider) mulled with sugar, cinnamon, ginger, nutmeg, and sometimes fruit, brandy, sherry, and even bread. By the 18th century, most cultures had a solid tradition and recipe for mulled wine. We will only look at a few of the most popular here: Glühwein and Glögg (pronounced "gloo-vine" and "gluig"). While similar, the differences in alcohol, spice, and garnish are very important to those who carry the tradition. Every town has its own secret recipe, so I am amalgamating the ones I've come across as there are several consistencies. The one thing I don't like in my mulled wine is fruit juice, and this doesn't show up very often save for more modern North American versions. It's not necessary and mutes the spice. Pour the wine into a large pot and add other ingredients. Simmer at low heat (do not boil) for 30-60 minutes and serve. There are MANY options here, including adding some allspice berries, maybe a 1/2 teaspoon of ground nutmeg, and adding some water should you simmer the wine too long or too hot, which will make it thick and syrupy. Serve in warmed mugs, and optionally add an ounce of brandy to make things interesting. Do not add the brandy to the heated mixture as the alcohol will boil off. Combine wine, port, water, orange peel, cardamom, cloves, sugar (start with 1/2 cup), cinnamon, and ginger in a pot and simmer at low heat for 10 minutes. Add more sugar to taste. At this point you can optionally let the mixture cool and have it steep in the fridge overnight before reheating to maximize the flavour. For those of you like me who are less patient, keep the mixture at low heat for another 20 minutes or so, being careful not to boil. Prepare 10 mugs by warming them and dishing out about 1tsp of almonds and raisins to each, along with the brandy if not used in the first step. Strain mulled wine into each mug and garnish optionally with a fresh orange zest or whole clove (or better yet, an orange zest with a whole clove stabbed into it). To be further adventurous, you can soak the almonds and raisins beforehand in a mixture of spice and akvavit. Leave them in a sealed bag or container for at least 24 hours with some cardamom seeds, cloves, and cinnamon, and enough akvavit to ensure they're covered. Even just soaking in the akvavit will extract a surprising amount of flavour from the spirit, which includes caraway, cardamom, cumin, anise, fennel, and citrus. For anyone not accustomed the flavour of this spirit, soaking the raisins and nuts and adding them to the mug when served is a subtle and fancy addition of the flavour. Mulled cider is another very common and fitting winter drink (and is synonymous with Wassail today). I feel it would be redundant to list a recipe here. Following either of the above mulled wine recipes or variations thereof would work just fine if cider is substituted for the wine and the sugar is omitted. For all three drinks, other spices that would make great additions include a little nutmeg, whole star anise, allspice berries, and a few slices of citrus. Broken cinnamon bark can be used in place of cinnamon sticks, though use it more sparingly as it has higher surface area. I again stress that adding the spirit while serving and not while steeping is a better option to ensure full flavour and alcohol.